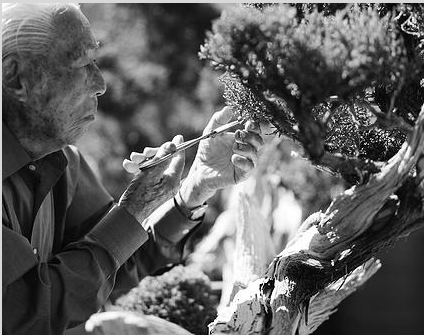 March means it is time for Harry Hirao, his 97th birthday, and a wonderful demonstration with a California Juniper. Harry is renown for his work with this species of juniper. He and other club members have shared with us grand stories of desert safari type trips to search for and dig them up in the wild. The materials that he has worked on as demos in the past have been superb specimens of living art. Harry Hirao is in demand all over the world and the fact that he chooses to come visit our club is a true honor. Let us show him the respect he deserves and our gratitude to him for sharing his experience with us. He usually doesn't say much and works away until he completes the tree. Harry will most likely have several assistants who will help the process go quicker. Someone will also be answering questions and keep us abreast of what Harry is doing. Come celebrate with Harry, his birthday, and his amazing talent and be happy we have so much to enjoy.